If you are open to exploring science communication and teaching with comics, this article is for you. Our next twitter chat will be Tuesday, November 7th at 6pm PT/7pm MT/8pm CT/9pm ET. Make sure to follow our official account, @scicomm_JC, so you can join in on the fun. This month’s chat is hosted by Dr. Echo Rivera, @echoechoR and the topic is about using comics for science communication. Are comics an effective teaching tool in STEM? That question inspired Dr. Caitlin Donahue Wiley and Dr. Kathryn Neeley to conduct a much-needed study on the impact of comics on their undergraduate engineering students’ learning. 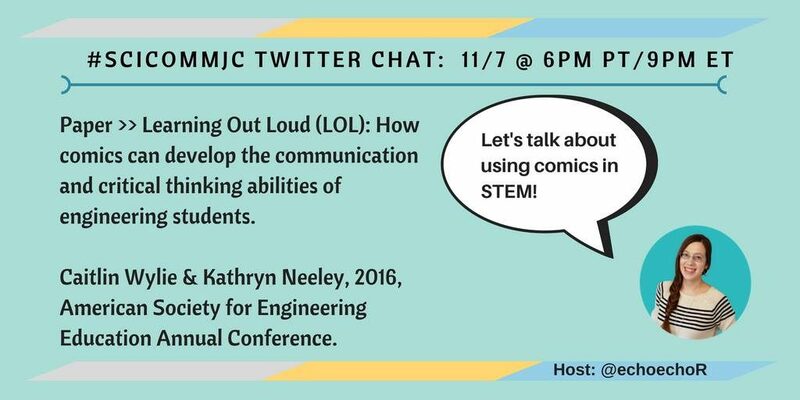 This blog post summarizes their conference paper, Laughing Out Loud (LOL): How comics can develop the communication and critical thinking skills of engineering students. In 2010, 30% of students were bored most or all of the time (Rosegard & Wilson, 2013; as cited in Donahue & Neeley, 2016). That’s why seeking a strategy to more effectively engage our audience is a worthwhile endeavor–and creating a bridge into to the creative arts is one way to go about this. Design: The study was conducted by two instructors, each teaching two separate sections of a course about ethics in engineering. Each instructor included cartoons for instruction in one section, while excluding cartoons for the other section. In addition, while Neeley revealed and discussed the answers to the assessment with her class at the conclusion of the lecture, Wiley did not discuss or review the answers. Hypothesis: Students in the “with cartoons” group will better remember and understand the theories in both the short and long term than their peers in the “without cartoons” condition. Results: At post (assessment at the end of the class), students in the “without cartoon” scored higher compared to the students in the “with cartoon” group. However, at follow-up, students from the “without cartoon group” forgot more information than the students from the “with cartoon” group. Students in Neeley’s class, where students had the opportunity to review and discuss the assessment questions, “with cartoon” students showed a 19-point improvement in scores at follow-up. Conclusion: Cartoons seem to enhance learning and retention of lecture material in long term. However, more research is needed. One reason the post scores were lower could be because the accurate definition of course content might have been lost during the discussion. The authors also review research from other fields to provide additional support for why comics show the potential for increased learning among students. These studies are presented in section 2 and 3, and summarized briefly below. A highly desired skill set includes the ability to consider multiple perspectives and understanding the social context within which we operate. The articles provide a thoughtful summary of how cartoons are particularly effective and helping STEM students develop these skills. Comics are symbolic, and that “require interpretation based on cultural awareness and critical thinking” (p. 11). Finally, comics promote dual processing learning that combines emotional and visual material, which is helpful for a wide range of students ( p.13). Boredom and attention are complex phenomena to study (as are most things), and boredom is not necessarily always a bad thing, in every context. However, apathetic boredom (p. 5) is a concern in educational settings. One promising strategy for counteracting boredom is variety–something that comics and cartoons can bring to a classroom. Paying attention, humor, a moderate amount of arousal, and curiosity are also important for learning and memory. Unsurprisingly, those “who pay attention remember more” (p. 7). The expectation is that comics will be more attention-grabbing and spark students’ curiosity (p. 6). Dr. Echo Rivera is a research associate at a research & evaluation center, where she works with programs to evaluate their impact. She also specializes in using effective, visual, and creative communication for dissemination. Echo is the owner of Creative Research Communications, LLC where she teaches researchers, scientists, academics, and evaluators how to effectively communicate their research. You cannot make it to the live chat? If you are interested in an updated version of this summary with highlights from the chat, and summaries from our future chats, please subscribe to our blog to receive them in your inbox.